Open Impressionism: The Works of Erin Hanson is the first comprehensive presentation of Erin Hanson’s career. 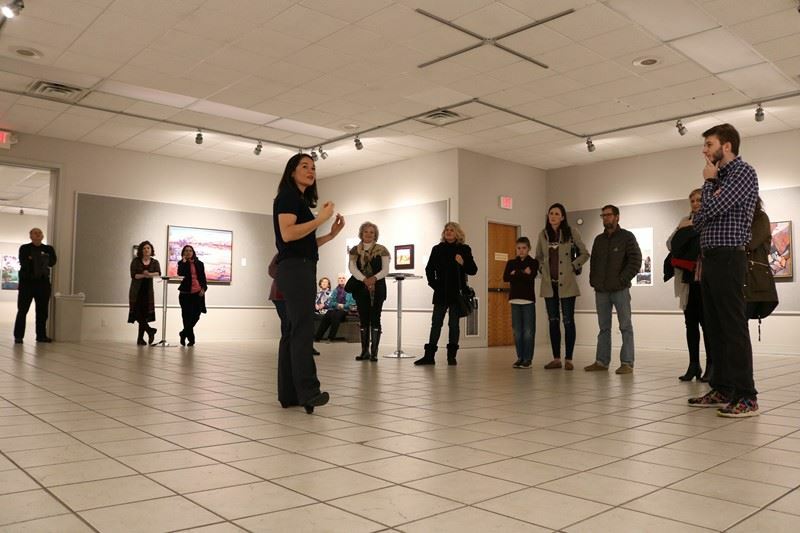 Organized by the Goddard Center for Fine Arts, this exhibition features a selection of never-before-exhibited works from her personal collection as well as paintings highlighting her prolific output over the past decade. The exhibition includes some of the very first Open Impressionism paintings, as well as several mid-career paintings that demonstrate the development and refinement of Open Impressionism. A room will be dedicated to Hanson’s earliest Open Impressionistic paintings, on loan from private collections. 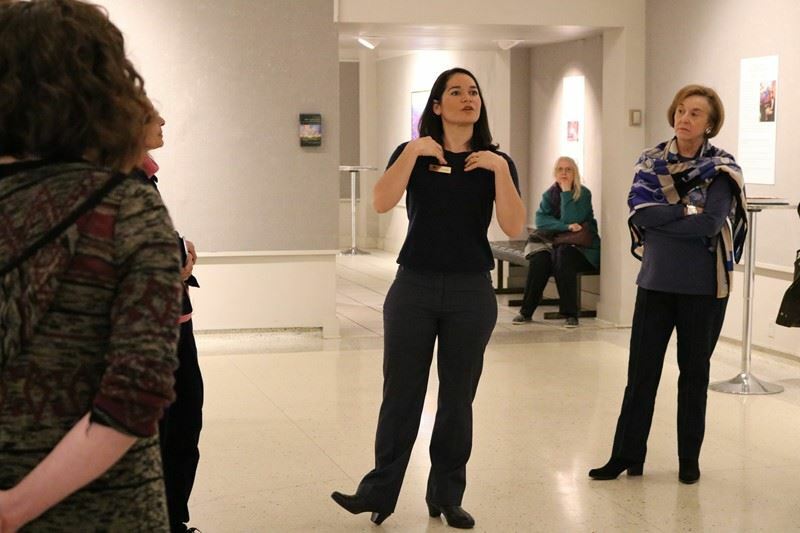 Informational placards were placed in each room to guide the visitors through her journey of Open Impressionism since its inception in 2006. 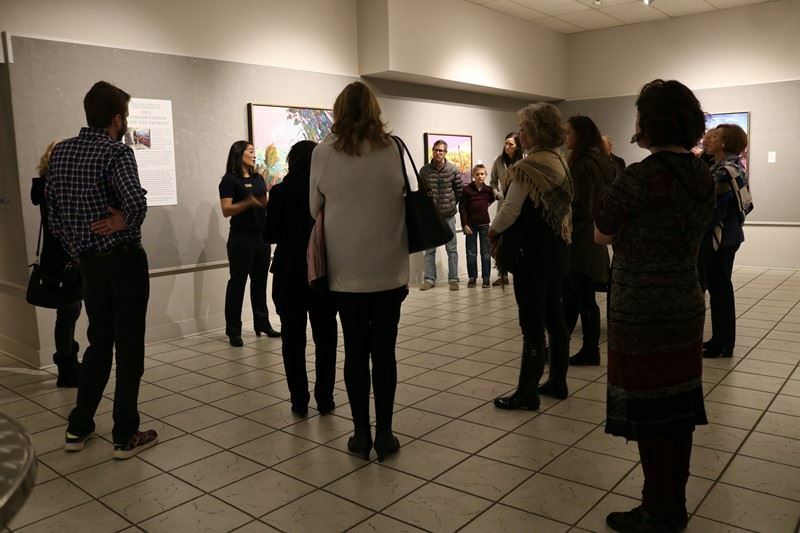 We will share the in-depth informational sheets with corresponding images for those of you unable to visit the Goddard Center to experience the exhibition in person. 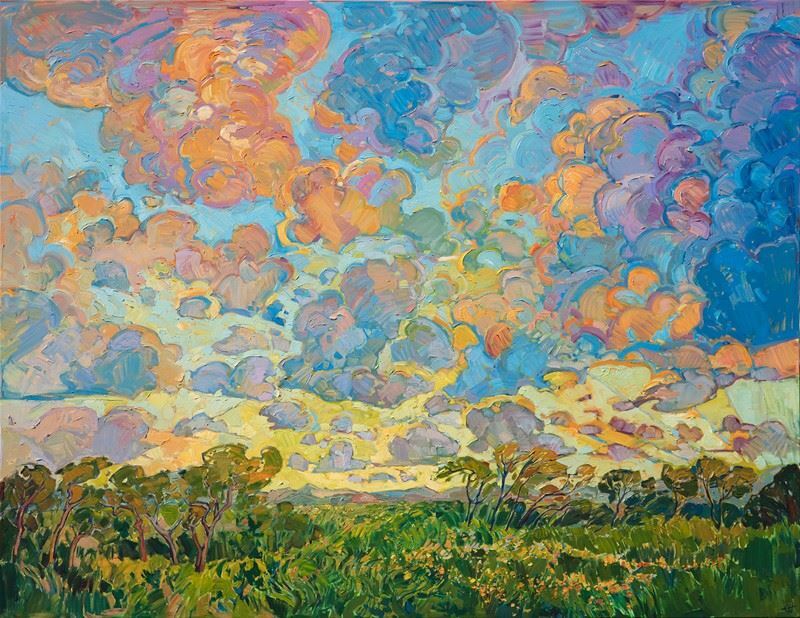 Erin Hanson began painting in oils when she was 7 years old. 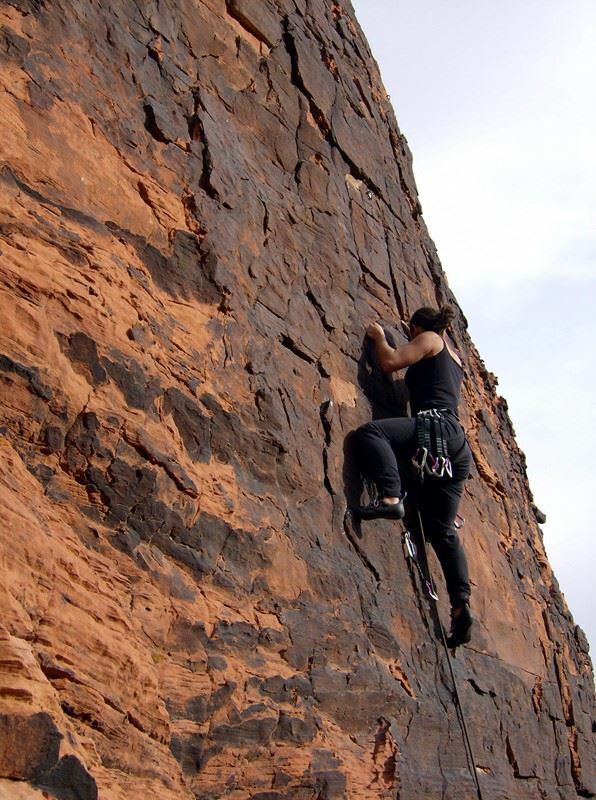 She experimented in many different styles and mediums over the years, but a new and distinct style was born when she moved to Las Vegas and began rock climbing at age 25, marking a turning point in her life and career as an artist. Her unique style of contemporary impressionism later became known as “Open Impressionism.” In contrast to Los Angeles where Hanson had grown up, the wide open and colorful desert landscape of Nevada was incredibly appealing to the artist, and she decided that she would paint landscapes exclusively. 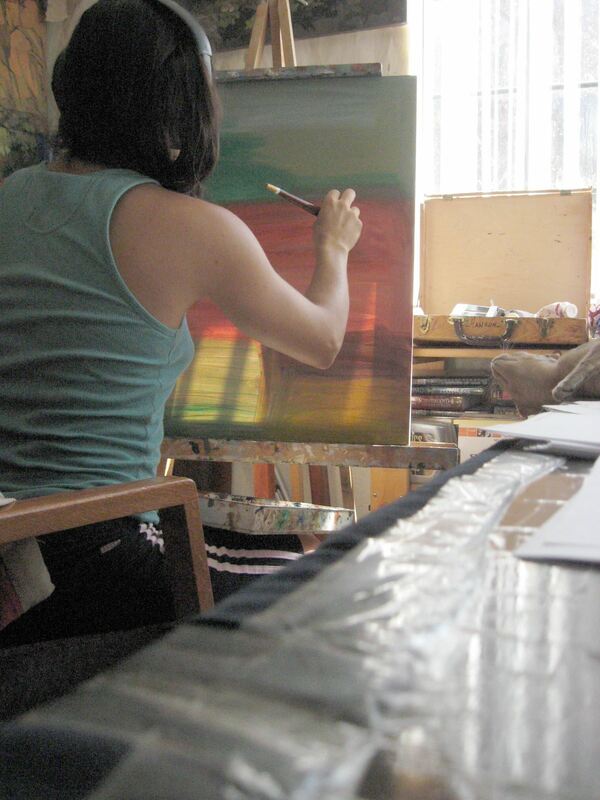 At age 25, she m ade a personal decision to create one painting every week, in order to develop her skills as an artist. 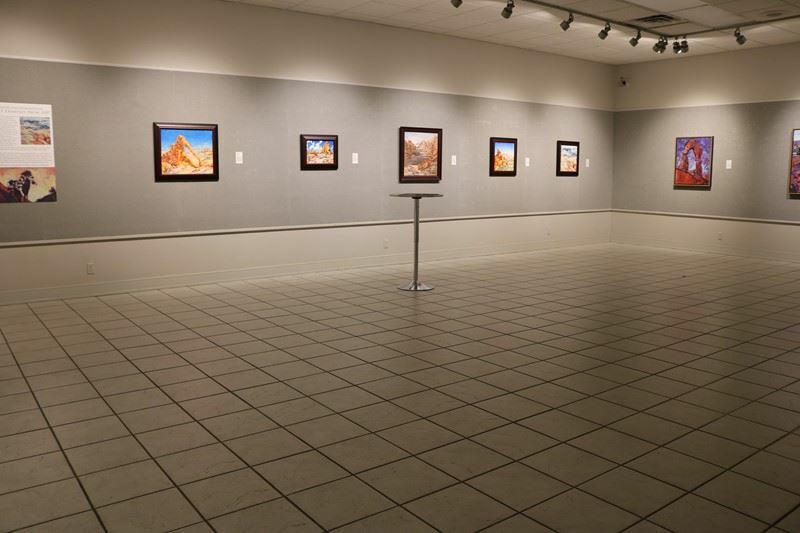 The startling red, orange and yellow colors of Red Rock Canyon were vibrant and appealing, and the young artist painted almost 50 paintings of the Nevada desert during her first year living in Las Vegas. 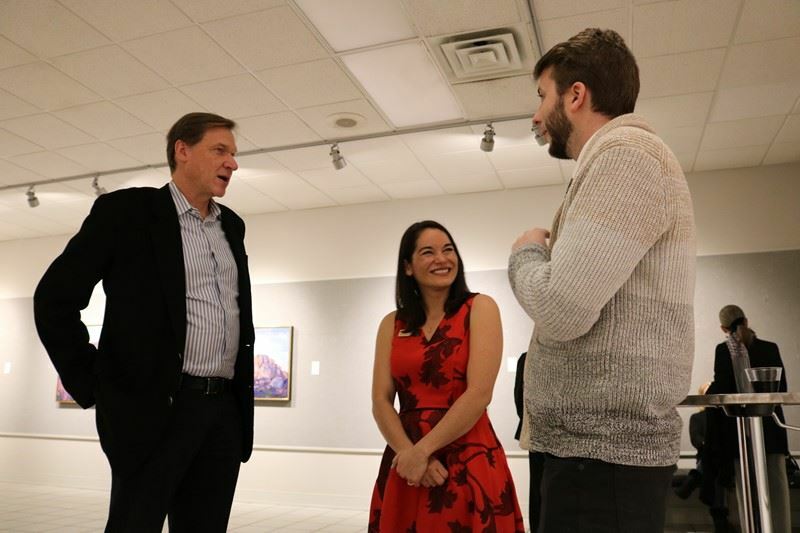 This early collection includes paintings of Boulder City, Valley of Fire State Park, and of course Red Rock Canyon where she rock climbed every week. 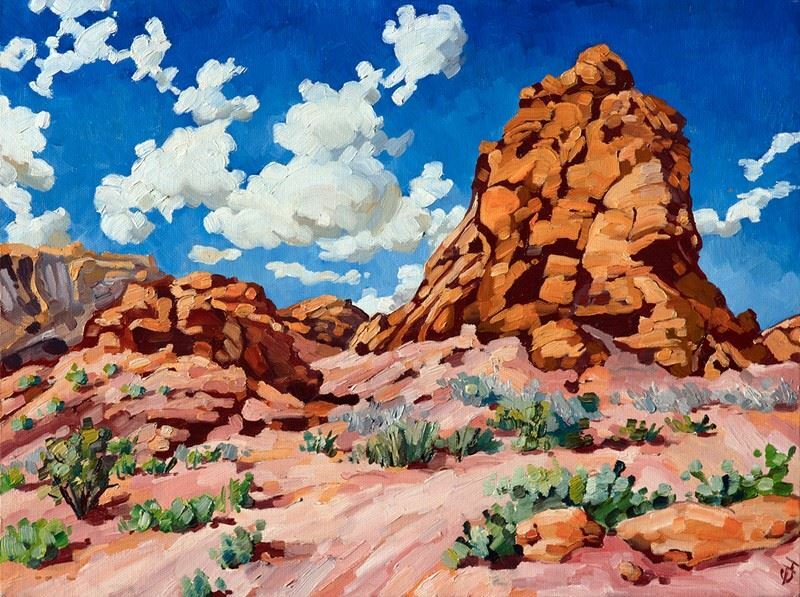 Hanson attributes the chunky, abstract nature of Open Impressionism to her method of painting Red Rock Canyon for the first two years of her career. Dark cracks in the rocks of separated the distinct planes of color in the rocky cliffs, creating defined areas of light and dark and a medley of abstract shapes within the rocks. 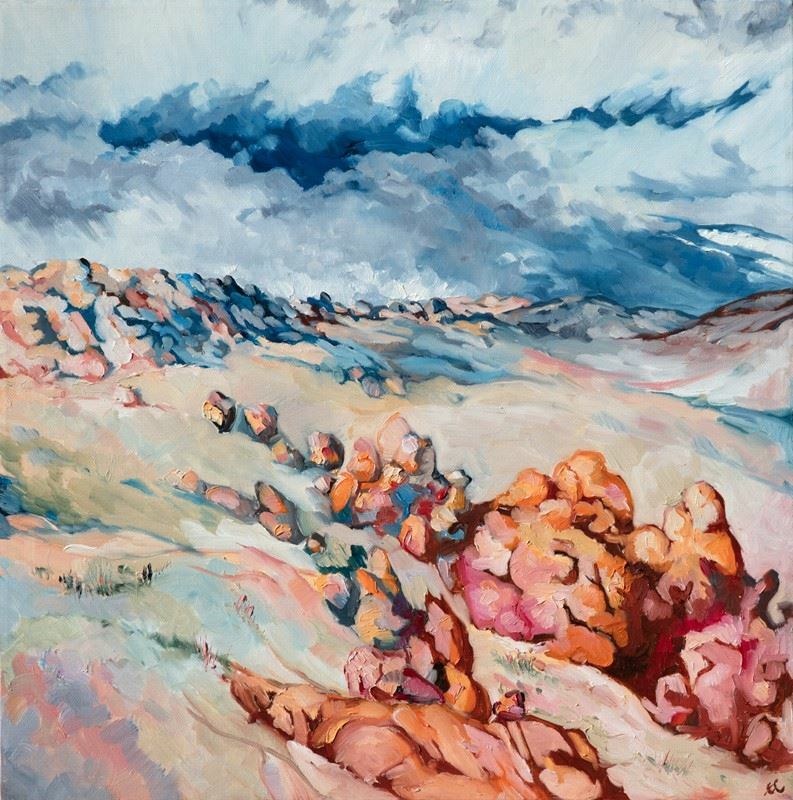 To emulate this effect in her paintings, Hanson likewise used dark lines to delineate planes of distinct color, and her brush strokes were naturally “square-shaped” to communicate the square angles of the rocks. This room of the exhibition includes Hanson’s earliest Open Impressionism paintings, created between 2006 and 2011. You can see the progression and change of Hanson’s style from a pastel color palette with small brush strokes to her “blue/purple” phase where she began experimenting with larger brush strokes placed more freely across the canvas. 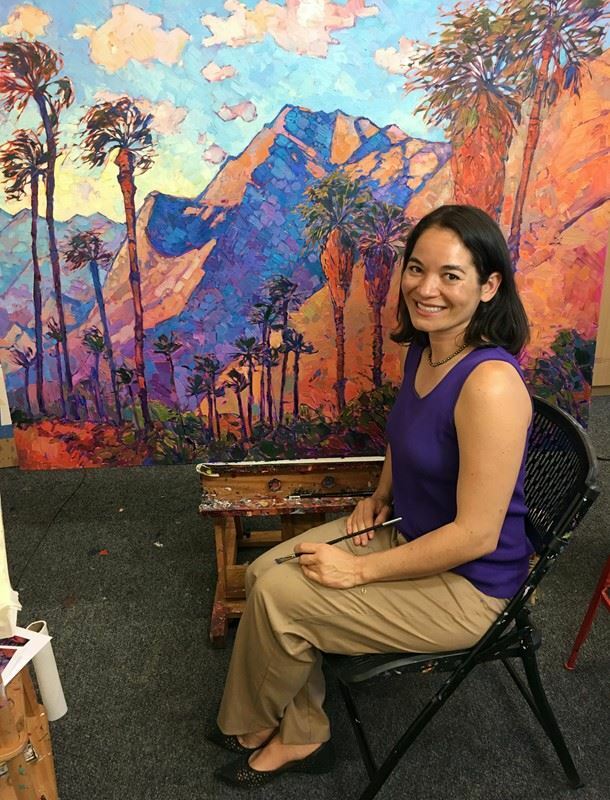 She started rock climbing in Joshua Tree National Park in 2009, and you can see here some of her first landscape paintings of the California desert. Later that same morning, Erin Hanson met her camping neighbors, who were professional rock climbers just moved to Las Vegas. The group became fast friends, and Hanson was taught to climb and lead to a 5.12 level. Spending a few days climbing in Red Rock Canyon every week, and making frequent forays into Utah, Mount Charleston, and Valley of Fire, gave Hanson hundreds of opportunities to experience the natural beauty of the desert and provided a never-ending source of inspiration for her landscape paintings. 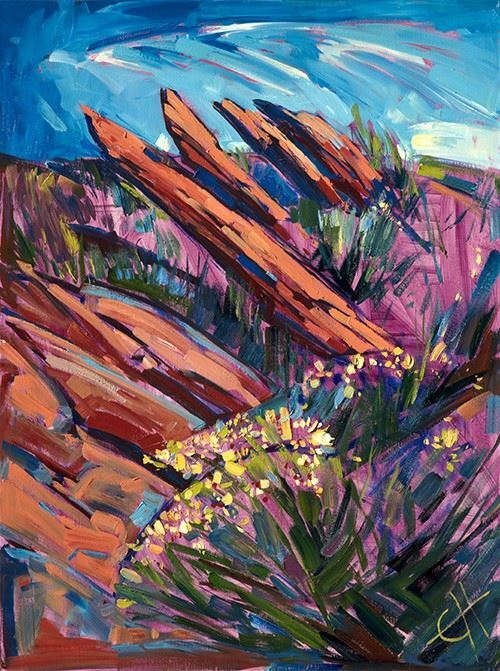 Erin Hanson’s first experimentations in painting red rock landscape employed richly colored cadmium hues of red and orange. The bright pigments were diluted with a lot of white paint, creating delicate pastel colors. The brush strokes were small and carefully placed, often overlapping and blending together. There was no underpainting in these first paintings, so the artist had to keep the brush strokes close together in order to cover up all the white canvas underneath. These early examples from 2007 are displayed here on the same wall, framed in dark wood frames. As a side note, the dark wood frame on the center painting, Boulders, was hand-made by the artist with a small miter saw and right-angle clamps. Early in her career, Hanson began using an underpainting, or a toned canvas, in her oil paintings. Her discovery of underpaintings was accidental: one day she decided not to paint over an old painting with white gesso first – instead she just sanded down the painting and went to work directly over the old painting underneath. There was a surprising addition of color and texture to the finished painting, and Hanson has been using a pre-painted underpainting ever since. 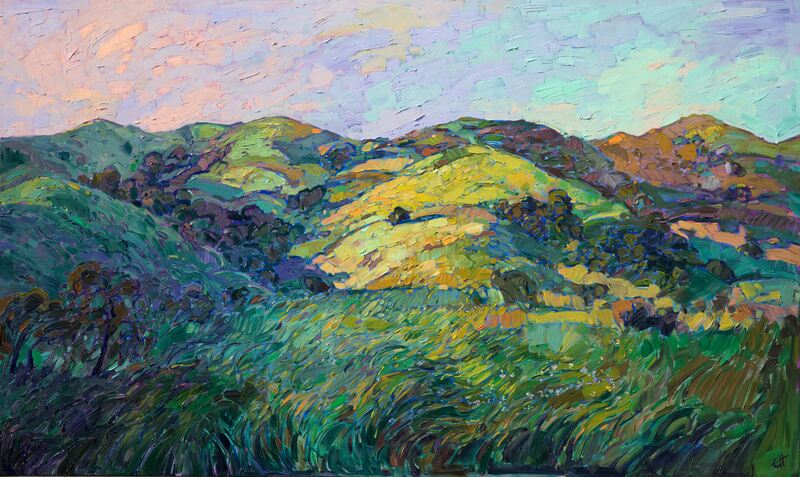 By 2012, Erin Hanson had moved back to Los Angeles. From there she discovered the idyllic rolling landscapes of Paso Robles wine country. She was immediately drawn to this new landscape of rounded oak trees and verdant hillsides, such a contrast to the stark desert beauty of Red Rock Canyon. She began painting wine country paintings, applying her Open Impressionism technique she had used to create desertscapes to this new landscape of slopes and curves. This room displays a selection of works Erin Hanson created in 2012. You can see the change in her style as she was forced to adapt to new colors and experiment with new forms in the landscape. She tested out many shades of green and blues, discovering which color palettes would capture the vibrancy she saw and felt out of doors. Most of her paintings are inspired either by dawn or sunset light, when the colors in the landscape are at their most beautiful. 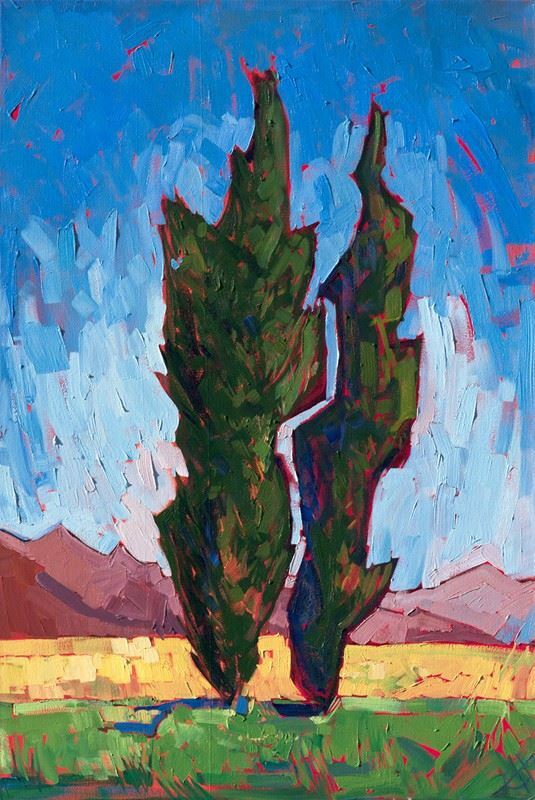 Over the years, Hanson created over 400 paintings of Paso Robles, falling more and more in love with the gnarled oak trees, springtime wildflowers, and summer gold grasses. Erin Hanson creates at least one painting every week, most of which are claimed by collectors while they are still drying on the rack. This room shows a staccato glimpse of the body of work that was created in 2012, including several pieces on loan from private collections. 2013 marks the 7th year in the development of Open Impressionism. You can see in this selection of paintings Hanson’s continued experimentation with the abstract. Hanson has always sought out the abstract nature of landscapes, being particularly drawn to compositions that emphasize the simplified nature of the outdoors. In these paintings, you can see Hanson bringing the abstract into her works, whether it is the unique shape of sky between the branches of a tree, or the unusual shape of a red rock fin formation rising out of a flat desert floor. Hanson had by this time fully developed her use of an underpainting, incorporating the underlying color into the composition of her works. Up until this point, Hanson had been using the same four colors in all her paintings: ultramarine blue, cadmium yellow light, alizarin crimson, and pthalo green. Using this limited palette, Hanson would pre-mix all the hues that were to appear in the painting, spending hours creating gradations of light and shadow on her palette before she picked up a brush to begin painting. In 2013, Hanson began experimenting with using other colors in her paintings. While still using a limited palette of 4 or 5 pure colors, Hanson experimented and pushed the boundaries of traditional color use. Her goal was always to capture the emotional content of being in the wide outdoors, and the use of color has always been one of Hanson’s tools to convey emotion. One of the hallmarks of Open Impressionism is the artist’s full incorporation of the underpainting into the communication of the painting. Instead of being a color that peeks through the brush strokes here and there, Hanson uses the underpainting to convey an entire range of mid-tones or shadow-values. In this painting, you can see a good example of Hanson pushing the boundaries of an underpainting. The underpainting in this work is a mid-tone ultramarine violet color. Hanson uses the underpainting to fill in all the rich shadows in the painting, using the second layer of oil paint exclusively to convey light and shape. Nearly half the canvas stands alone as the underpainting, without any layer of paint applied on top. The underpainting also creates a beautiful sense of transparency in the oil painting, hinting at reflected light and rich undertones of shadow. 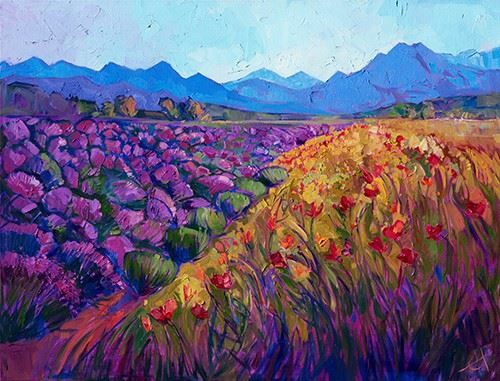 From 2014 to 2015, Erin Hanson created over 200 paintings inspired by her travels across the western states. Her frequent forays into the National Parks and backpacking photography trips led to the creation of a huge body of work inspired by the outdoors. 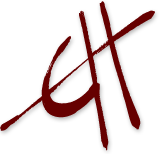 At this time in her career, Hanson also launched her eponymous gallery, The Erin Hanson Gallery. This gallery is now located in San Diego, California, and is also home to her working studio. She continues to travel around the world, finding inspiration for her unique view of the aesthetic. Most recently she has traveled to New England and Japan to experience the vivid autumn colors and famous Japanese red maples. 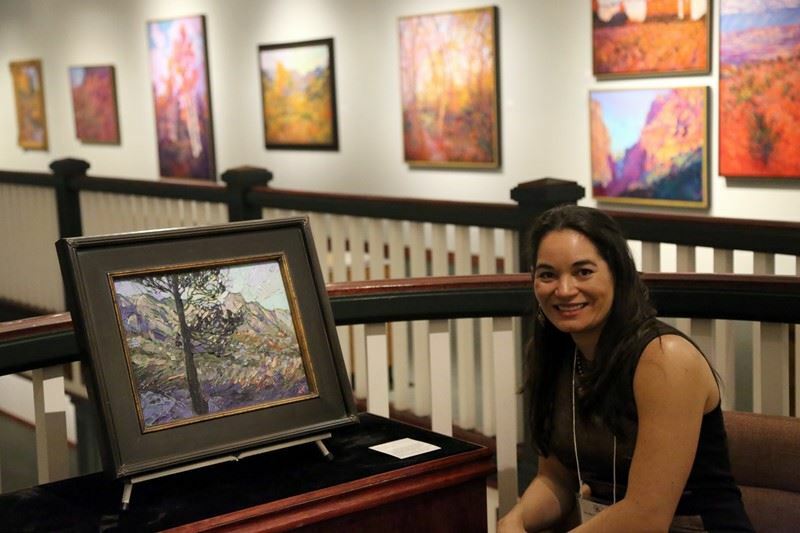 In 2016, Erin Hanson had her first solo museum show, exhibiting a collection of 35 works inspired by the National Parks, in celebration of the National Park Service’s centennial. 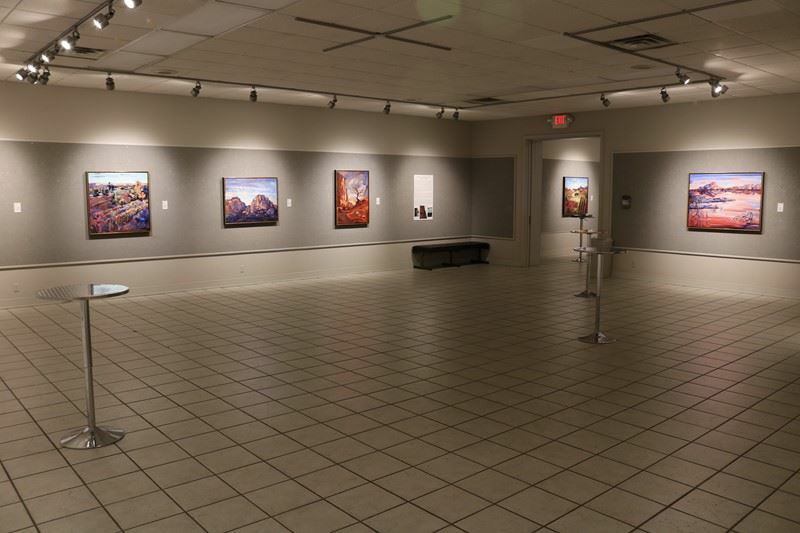 These paintings were displayed at the St. George Art Museum, near Zion National Park, one of the artist’s favorite haunts. She currently has solo museum shows booked out through 2021. 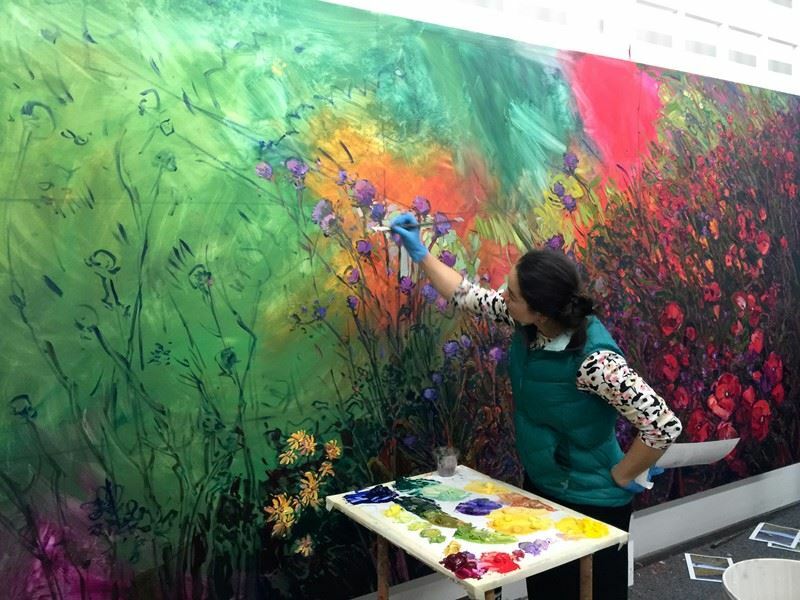 “When I was 12 years old, I worked in a mural studio painting giant 40-ft canvases in acrylic. The first task I learned was to create matching paint colors: the lead artist would mix up a little dixie cup with the color he wanted, and my job was to mix a whole gallon of paint that matched that color exactly. There were about 50 gallons of store-bought acrylic paint spread across the floor of the giant warehouse we worked in, and I had to learn how to pour and judge paint colors, combining basic primary colors to create exact hues of purples, greens, and oranges. “After demonstrating my ability to mix paint for a few months, I was allowed to put my own brush to the giant canvases we were creating. I fondly remember being perched up 20 feet in the air on some rickety old scaffolding, happily painting little groups of trees across a wide expanse of hillsides. We painted everything from skyscapes to abstracts, from herds of buffalo to circus clown scenes. AT FIRST GLANCE, Erin Hanson appears to be a study in contradictions: she is a natural landscape painter who was born and raised in the urban sprawl of Los Angeles; and as critics continue to wrangle over whether her style is Impressionist or Expressionist, she remains low-key and unassuming, while steadily producing an impressive body of work that is nothing short of exuberant. However, a particular harmony exists within these seeming paradoxes which serves well to help define her oeuvre. A trip to Paso Robles, gateway to California’s wine country, would mark the beginning of an important turning point in Erin Hanson’s career. Previously, the stark, majestic vistas of the mesas and valleys of the American Southwest had dominated her paintings; but the lyrical and breathtaking beauty that awaited her in Paso Robles proved irresistible to her. From its rugged coastal regions to the undulating hills and valleys of its verdant interior, Hanson had discovered a treasure trove of visually stunning landscapes, as variegated as the grapes and fine vintages for which this region has become world-renowned. The best measure of Hanson’s ongoing love affair with America’s wine country is the sheer volume of her paintings that its scenery has inspired. Erin Hanson’s richly colored and textured landscape paintings demonstrate a mastery of form and composition, with colors as vibrant and lavish as stained glass. Magnificent interplays of light and shadow lend additional depth and texture to her paintings. Her thick, skillful brush strokes reveal a purity of color and form and expression: they are the hallmarks of a true artist who has learned to convey her vision directly to the canvas without hesitation. In her own words, Hanson describes her style as “Open Impressionism,” in homage to the late 19th-century plein air Impressionists, but also with a nod to the modernist, more subjective Expressionist movement of the early 20th century. Her paintings literally vibrate with emotional intensity, conveying the lush, sensual freedom of the open air while somehow also instilling the viewer with an underlying sense of harmony and balance. There is a remarkable synchronicity between freedom and discipline to be found in the sanctuary of her vivid landscapes, which is not easily defined. One does not merely look at her paintings; rather, one experiences them. This room contains the most recent examples for Open Impressionism, drawn from Hanson’s works during the past two years. Here you see a refinement of Hanson’s style, quite a difference from her paintings 10 years ago. 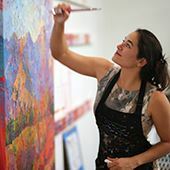 Her brush strokes are confident and sure, a true testament to the mastery of her craft, as evidenced by a decade of trial and error, constant experimentation, and creation of over 1,500 original oil paintings in the style of Open Impressionism. 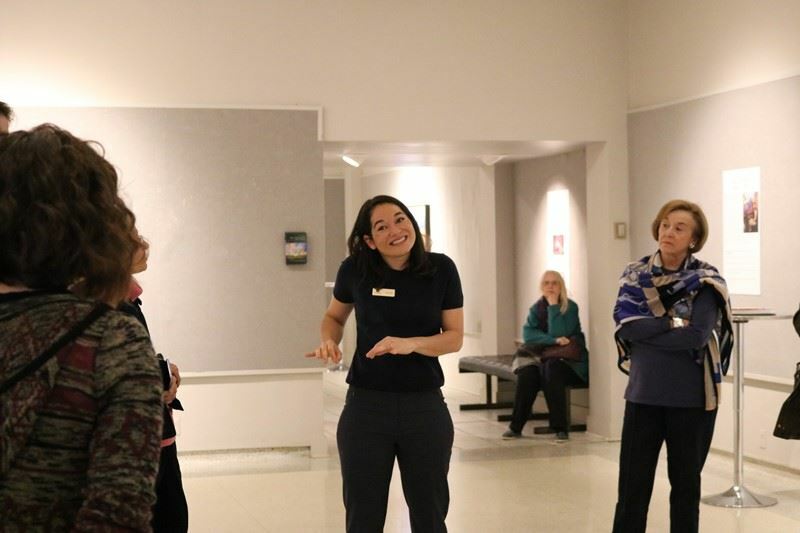 This exhibition at The Goddard Center is the first exhibition that shows the full development and refinement of Open Impressionism with the physical paintings present. 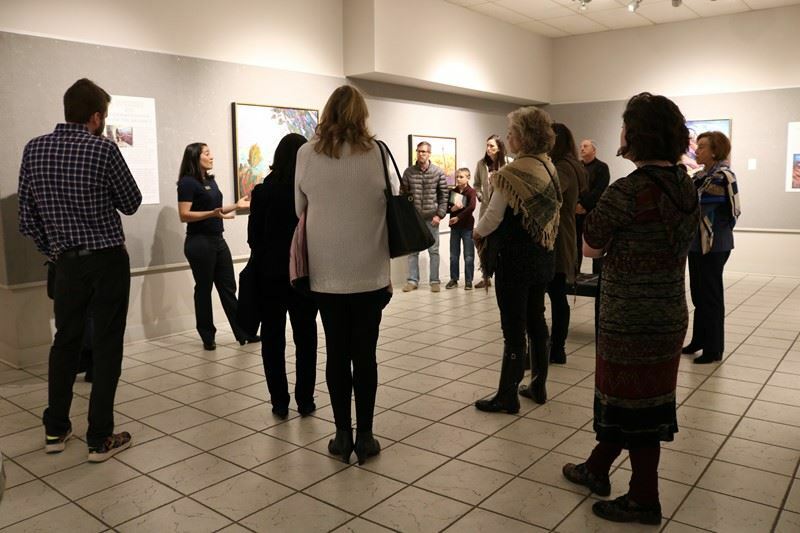 Open Impressionism is unlike any other style of painting and truly stands by itself in the contemporary art world. While inspired by the impressionists of the past, Hanson has a more expressionistic manner of painting, and her works attempt to recapture the emotional content of the outdoors, instead of merely the light and forms of the landscape. While Open Impressionism was developed over the span of 10 years and certainly changed as the artist experimented and refined her techniques, there are some basic hallmarks of Open Impressionism that we can take note of. Open Impressionism is best described as abstracted, contemporary impressionism. The brush strokes are loose and expressive, conveying a sense of movement and transient light. Because the brush strokes are applied alla-prima, without layering, the paintings have a mosaic or stained-glass quality to them. The underpainting is allowed to appear through the brush strokes, giving a sense of underlying light to the painting. Erin Hanson pre-mixes her entire palette before she begins painting, planning out her colors in advance and mixing the full range of hues from only a few pure pigments, known as a “limited palette.” By limiting the colors on her palette to only 4 or 5 primary colors, Hanson can create a full range of pure and vibrant colors. Her paintings are never dull and muddied, but instead, have a crystalline or back-lit appearance. She always focuses on the light in a composition, letting the shadows fade into indistinction. When she paints, Hanson tries not to go over the same spot on the canvas more than once; she tries to “get it right the first time.” This has two effects: one, the brush strokes are very textured, since they have not been flatted out by repetitively going over the same place on the canvas; two, the paintings have a sense of spontaneity and freshness to them, and they never appear overworked or overly detailed. This impressionistic approach to painting allows the viewer to participate in the finished artwork – his imagination must “fill in the blanks,” instead of the having the whole literal landscape dictated to him like a photograph. When Hanson paints, she focuses on a single dramatic aspect of the landscape, and this single communication is what is felt in her paintings.